With hundreds of styles to choose from, our vertical blinds transcend the ordinary because they are distinctive, classic and long-lasting. Selections include fashionable smooth and textured vinyls, as well as fabrics ranging from basic non-wovens to decorative weaves and jacquards. Clear Magic Insert Groovers are available with our fabric styles to combine the soft, textured appeal of fabric with the insulation, light control and privacy advantages of vinyl. 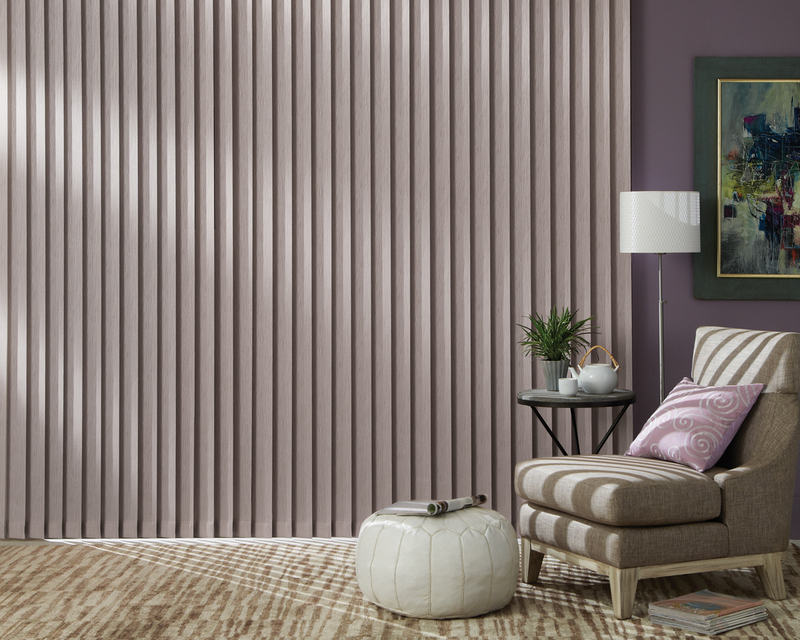 No other treatment offers the unique combination of fashion, form and function like vertical blinds. Full selection of textures, styles and colors. Fashionable Curved Vinyls – Our offering provides a diverse selection of styles encompassing embossed, matte, smooth and the popular ink wash finish. Vinyls are unique in that they provide total privacy, functionality and fashion. S-shaped Vinyls – The S-shaped design presents an elegant rippled-like effect commonly seen in draperies. The interlocking vanes block out more light than the traditional curved vanes. Decorative Fabrics – A beautiful selection of fabrics ranging from simple stitchbonds to jacquards, in a variety of opacities from soft, light-filtering to opaque, offer soft elegance. Free-hanging With Sealed-In Weights – Ultrasonically sealed-in weights are standard on all fabric free-hang vertical blinds at no additional charge. Bottom chains are available on any free-hang fabric or vinyl vertical blinds upon request, also free of charge. Fabric Inserts – Clear Magic Insert Groovers, available for all our insert style fabric verticals, are guaranteed to remain beautifully clear for the lifetime of the vertical blind. Groovers provide an added degree of privacy, energy efficiency, light control and a uniform appearance from the outside. Clear Magic Insert Groovers are available in both while and ivory. Optional Full 3 ½” Valance – An optional full valance is available to cover the headrail and add a finishing touch to any of our vertical blinds. Valance corners are gently rounded to provide a softer, uninterrupted look. Headrail System – All of our vertical blinds come standard with a high quality wheeled carrier system that offers smooth traversing and quiet operation. Self-aligning carriers keep vanes permanently aligned. Snap-in brackets make installation fast and easy. Valance Installation – Front loading valance clips make installing the valance a breeze. Control Cord And Chains – Standard – Both the traversing cord and vane rotation control chains are 3/4 of the height of the vertical blind. Longer lengths are available upon request, at no additional charge. Safety Wand-Optional – A single, easy-to-use wand, available at no additional charge, provides both traverse and rotational vane control. A simple twist of the wand rotates the vanes open and closed. Pulling the wand across the blind draws the vanes back and forth. By eliminating the cords and chains, the safety wand helps protect children and pets from injury. Multicolor Verticals – Any number of colors, within the same material group, may be combined into one vertical blind for a unique, totally customized look at no extra charge. Specialty Shapes – Our vertical blinds can be constructed to fit unique window shapes. The vanes custom cut and finished to fit.